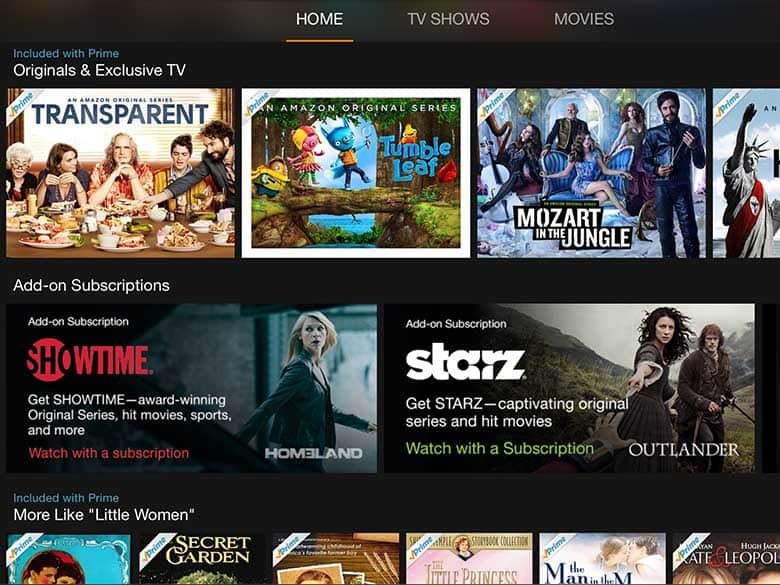 Slickdeals News & Articles News Amazon Prime Video: Which Subscription Add-Ons Are Actually Worth It? Amazon Prime Video: Which Subscription Add-Ons Are Actually Worth It? With 30 new add-on options for Prime members, some are more worthwhile than others. Amazon made waves last month when they debuted over-the-top (OTT) subscription programming for Prime members. This translates to 30 add-on offerings for members to choose from, with Showtime and Starz understandably generating the most hype. But cutting the cable cord and abandoning pay-TV bundles really comes down to the money, which begs the question — which Amazon add-ons are actually worth the cash? A few bucks here and there can certainly jack up your monthly bill (and fast), meaning you might not be saving as much money cutting the cord as you thought. We took a closer look at the Amazon subscription add-ons currently on offer, weeding out the ones that aren't all that impressive. Here's how we've sized up the options. If you're already shelling out a monthly fee for a traditional Showtime package, you may want to consider making the switch to Amazon. After a seven-day free trial, it'll only cost you $8.99 per month. The package boasts more than 600 films and shows, including hits like "Homeland," "Ray Donovan" and more. The price is definitely appealing, as unlimited viewing will run you $13.99 through DIRECTV. Meanwhile, Showtime's streaming service costs about $10.99, making the Amazon price point a pretty good one. The Amazon deal marks Starz's debut into the OTT game. Pricing is the same as Showtime ($8.99 per month after a free week-long trial), giving viewers access to more than 800 original shows and movies, like the mega-hit "Outlander." Traditional pay-TV packages will likely charge you $13.99 per month, making it a real standout on Amazon. While Showtime and Starz are arguably garnering the most attention, Amazon's add-on options also include some other pretty attractive deals. Acorn TV spotlights over 300 British films and series for $4.99 per month after a free 30-day trial. This includes more than 60 exclusive shows that viewers won't be able to find anywhere else, making it a particularly attractive option for those who love British TV and cinema. If horror is your thing, check out Shudder. For just under $5 a month, you'll get all the murder and mayhem you can handle. The "endless stream of screams" includes more than 250 shows and films. It also boasts a two-week free trial. The only perk of going directly through Shudder for a membership is that if you pay for one year up front, you'll get 20 percent off. For $5.99 per month, this kids offering actually isn't all that great, even after the seven-day free trial. HooplaKidz may include over 100 episodes of nursery-rhyme type content, but it's nothing you can't find for free on YouTube. As a parent, I'd rather put that money toward an ABCMouse subscription. IndieFlix's low monthly cost of $2.99 (plus a free 30-day trial) will initially hook indie-minded viewers, but some users have griped that the content is a bit chopped up, only offering "random short films." More specifically, the chief complaint is that for $2 more per month, you can enjoy the network's full offerings. For roughly $10 a month, the Gaia add-on delivers more than 1,000 yoga- and meditation-themed shows and films. If that's your thing, the boatload of content may be a gold mine for you. But unless you're really devoted to that lifestyle, $120 a year might feel a bit steep, leaving us unsure about this one. At $6.99 per month, Doc Club is all about critically acclaimed documentaries (more than 300, to be precise). But, similar to Gaia, spending more than $80 a year to watch award-winning docs might not be worth it for a lot of folks — especially cord-cutters looking to shrink their TV bill. Comedy lovers may perk up at Comedy Central Standup Plus, which showcases nearly 80 films and shows for just $3.99 per month after a seven-day free trial. Headliners like Amy Schumer, Adam Devine and Hannibal Buress are all on the list. Just don't expect to catch your favorite Comedy Central series as this package is, as the name implies, strictly stand-up. That said, if you prefer a wider offering of Comedy Central gems, a Hulu subscription might be a better bet. Our house is a cable-free one, so we catch Comedy Central originals like "Workaholics" and "Nathan for You" on Hulu. However, I know my comedy-junkie husband would swoon over this stand-up package. You can take a look at the full list of add-ons here. Have you given any of these a whirl? Drop us a line and let us know if you think they're worth the dough.